Steve Paul is one of the UK’s best epeeists of the last 50 years, having achieved L16 in the Olympics twice, won a World Cup, and was three times UK national champion. 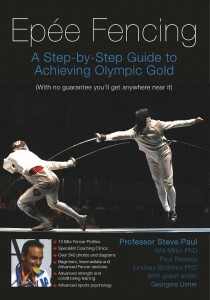 Currently an elite-level coach, he has finally set all his epee wisdom down in a glossy new book. With some 380 photos of great hits, classic fencing moves, fencing stars and epee kit in general, he tells you what you need to know to excell at the Beginner, Intermediate and Advanced levels. There’s fencing clinics for all the key moves, and there’s personal profiles of 13 elite fencers, including Paulo Pizzo, the current Men’s Epee World Champion. The advice for using sports psychology and strength and conditioning is right up on the latest research, and it comes with template guides to creating an annual training plan. There’s also a How to Fix your Epee section at the back too. But best of all he didn’t leave out his sense of humour. Not only is the book crammed with information, it’s a pleasure to read. Steve’s book can be purchased from Leon Paul London by clicking here.